We all know we should be thankful for the food on our tables — but why? Here are 14 eye-opening facts about nutrition, farming, and crop varieties around the world that help answer this question. 1. Poor people in developing countries often spend 60-80% of their income on food. Ayme family, Ecuador. Photo credit: Peter Menzel and Faith D’Aluisio. 2. 75% of the world’s food is generated from only 12 plants and 5 animal species. Kale is probably not one of them. 3. 165 million people suffer from childhood malnutrition. 4. Over 25 million tons of pumpkins, squash, and gourds are produced around the world each year. 5. Americans waste about 141 trillion calories worth of food every day. That adds up to about $165 billion per year — 4 times the amount of food Africa imports each year. 6. More than 9 out of 10 farms in the world are family farms. They provide more than 80% of the world’s food supply. A family of farmers in Nimba, Liberia. 7. Women make up 43% of the agricultural labor force in developing countries, and account for about two-thirds of the world’s 600 million livestock keepers. The majority of these women are from sub-Saharan Africa. 8. 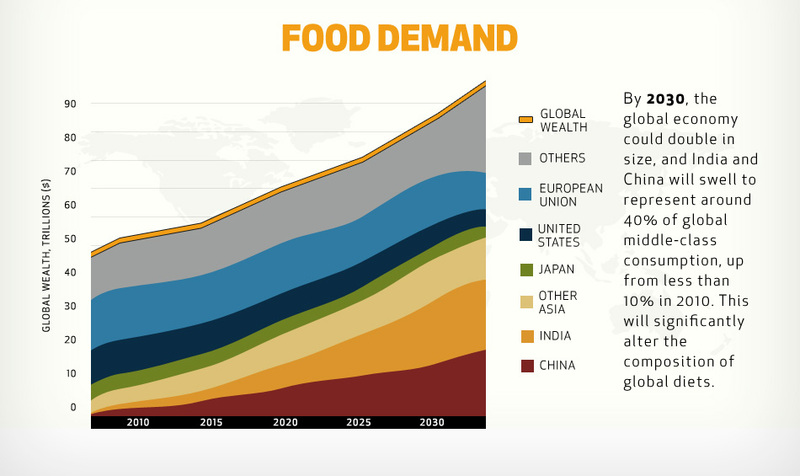 By 2030, global food demand is expected to rise by 35%. 9. 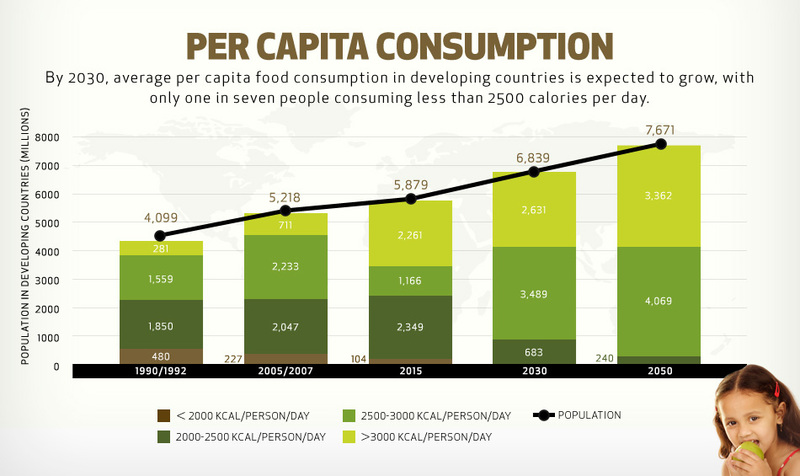 By 2030, only 1 in 7 people are expected to be consuming less than 2,500 calories per day. This is great news — it means more people in developing countries are eating more! 10. 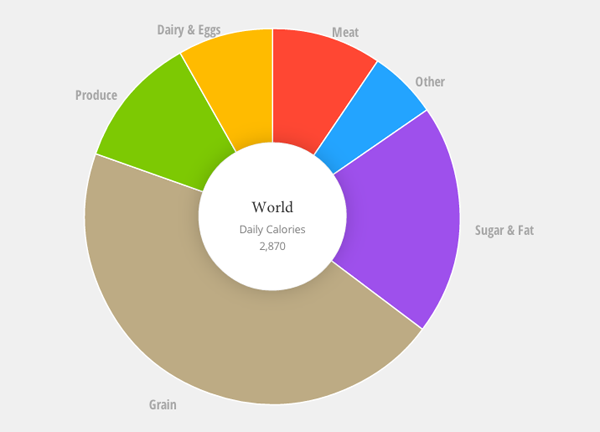 Grains make up 45% of the world’s diet. 11. Insects are among the most efficient forms of food available. Eighty percent of a cricket can be eaten, while only 55% of a pig and 40% of a cow are edible. 12. Agriculture provides jobs for around 40% of the world’s population. That means agriculture is the single largest employer in the world! 13. Africa’s total area is more than three times that of the US. Yet, the area of irrigated land in Africa is only 26.6% more than that of the US. This is a sign of pervasive poverty and massive underinvestment in agriculture! Map of the world’s vegetation. Photo credit: NASA. 14. In Africa, 97% of staple crops are fed primarily through rainfall. As rainfall in most parts of Africa is seasonal and erratic, the food production system is extremely vulnerable to weather-related shocks.